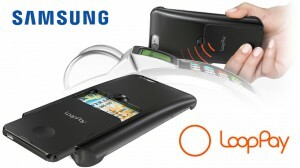 Samsung has acquired LoopPay, and it officially announced this information on Wednesday. The amount the tech industry giant paid for its acquisition of the company was not disclosed, however, the transaction has created speculation that Samsung may be backing this magnetic secure transaction technology in order to compete with Apple Pay and its reliance on NFC (Near Field Communication) technology. Samsung has not officially announced that it has any plans to integrate LoopPay’s technology into any mobile devices as of yet. LoopPay’s technology is presently available as a fob or add-on card which is attachable to a smartphone device or as part of a phone case. The magnetic secure payment transaction technology of LoopPay is different from the NFC technology that Apple iPhone 6 and 6 Plus uses with Apple Pay. The retailers who utilize Apple Pay are required to install payment terminals that have been upgraded to use NFC in order to accept Apple Pay. Merchant terminals that are already being used usually have magnetic card readers that are compatible with LoopPay. The Samsung company has been incorporating NFC in Samsung smartphones for the past 3 years in order to work with Google Wallet as well as other payment applications. Therefore, LoopPay is regarded as an alternative to the company’s present approach. Analysts have claimed that Samsung’s utilization of both technologies could help the company gain ground in mobile payments while NFC payment terminals become more popular in the United States. Big name credit card companies such as MasterCard and Visa claim that in the U.S., the adoption of NFC is moving ahead in association with a movement towards EMV, “pin and chip” (also known as “smart”) credit and debit cards. Around half of the estimated 12 million U.S.-based payment terminals will be converted by the end of this year. LoopPay will be able to mimic contactless transactions and it is easier for consumers than Apple Pay, in certain ways. It is expected that for 90% of U.S. retail locations to convert to NFC terminals, the process will take somewhere between 5 – 10 years.